This is a real chess sensation: Vladimir Kramnik, 28, from Russia, the current World Champion in International Chess, is starting to get interested in Makruk Thai. He has already played a match of Makruk Thai against the German journalist Dr. René Gralla, on the occasion of a simultan performance at the most important museum of Germany, the "Federal Hall of Arts" at Bonn, the former capital of Germany, on May 1st, 2004. And Mr. Kramnik has proven that he is the true World Champion of Chess - so he has learned Makruk Thai at once, and he has defeated his challenger, the author Dr. René Gralla, at once. "Makruk Thai is more strategic than International Chess", that is the résumé by Mr. Kramnik. "You have to plan your operations with total care since Makruk Thai can be compared to an anticipated endgame of International Chess." Now Mr. Kramnik is looking forward to a new challenge in Makruk Thai: He would like to play a mixed match of Makruk Thai and International Chess against the current Champion of Makruk Thai in Thailand. That is Mr. Tor Pagnaam who has just opened his own club at Samut Prakam, a provincial city round about 30 kilometers southwest of Bangkok. Here are the highlights from the first match of Makruk Thai that the World Champion of Classic International Chess, Mr. Vladimir Kramnik, has ever played in Makruk Thai. 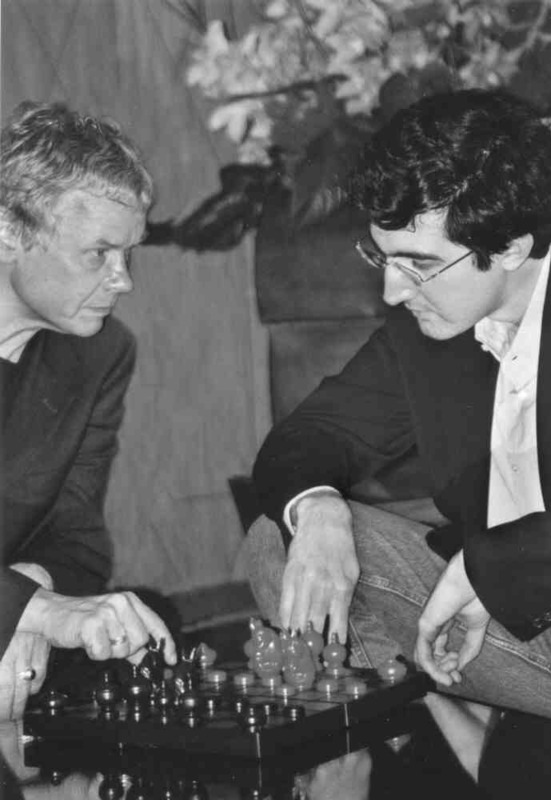 Moreover this fragment seems to be historic - because that match seems to be first match of Makruk Thai ever that a World Champion of International Chess has played during the long history of chess. Before starting to replay just remember the differences between Makruk Thai and International Chess. In Makruk Thai the opening set-up is very similar to that of orthodox chess, with the following differences: the positions of White King and White Queen are reversed - White King is positioned on d1, White Queen is positioned on e1 -, and all Pawns are starting out already on the third respectively sixth row. the Thai Bishop moves one square diagonally or, and this extra-ability is turning the Thai Bishop into a rather tricky piece, one square straight forward. The Pawn is moving just like a Pawn in FIDE Chess, but since these infantrymen are starting out already on row no. 3 (or no. 6, respectively), a Pawn is not allowed to make a double step on its first move. When a White Pawn is reaching the lateral no. 6 (and a Black Pawn is reaching the lateral no. 3, respectively), so the soldier will be promoted to become a Makruk Queen already there. The King, the Rook and the Knight are moving the same way, as the corresponding pieces are moving in International Chess. With one more exception: There is no castling in Thai Chess. Now let's see how the World Champion in Classic Chess, the 28-years-old Vladimir Kramnik from Moscow/Russia, is handling these - slightly - different rules. After these first three moves the position is looking like a kind of English Opening, being answered by a Dutch defence - having been transformed to the scenery of Makruk Thai. Tough fighting has followed, with the result that Black has lost a Pawn after a blunder. In the end a position like this has developed (diagram). Black has overlooked this possibility. Now there is a very funny coincidence - if we are looking at this position from the point of view of International Chess. So let's first show the diagram with symbols that are used in FIDE Chess(diagram). If the situation shown right above would have been a position of International Chess, so Black could have check-mated the White King by move no. 2: 5. ... Bd4+ 6.Kb3 Rb2#. A lucky moment - check-mate a real World Champion of Chess after move no. 2. But unfortunately, this is the wrong movie ... since this is not match of FIDE Chess, but a game of Makruk Thai (diagram). So, since this is Makruk Thai, Black has to resign: because of the three deadly possibilities of White: 6.Rxb6 ... or 6.Rh7+ ... (after 5. ... Ba7) or 6.d6=Q+ ... (after 5. ... Kc7). In the end no big surprise, of course: the World Champion of Chess is the World Champion of Chess is the World Champion of Chess. After the bitter defeat in Makruk Thai against World Chess Champion VladimirKramnik, the German journalist Dr. René Gralla has been more lucky against the strong German player Torsten Mendel, on the occasion of a training tournament at the Portuguese Café "Transmontana" at Hamburg, the big port city in the north of the Federal Republic. During that match - that has been interrupted two times - a friendly "tewada", a helpful ghost from Southeast Asia, has helped the commander of the Black army to induce the White troops into a funny stalemate-situation: They have been blocked hopelessly so that they had to surrender though the majority of the pieces still have been on the board. Losing time, in the end. Plus: the Knight can not hold on to that position, in the long run - so that excursion of the left-wing "ma" will be turning out to be premature. That seems to be the decisive strategic miscalculation already: White is producing - without being forced to do so - a fatal gap on the square e4. This would have been dangereous in FIDE Chess - because of the power of a Bishop if that piece would occupy the diagonal b7 - h1. But it is very doubtful in Makruk Thai too - even if the Thai Bishops, moving no more than one square by every move, are significantly slower to exploit that weakness in the camp of White. It is no real surprise that e4 will be the gate of a Black assault, in the not so near future. That is to say: 12 moves later. White is already sensing the weakness - so he is trying to observe the ominous square e4. A kind of "fianchetto" in Makruk Thai. And even if a Bishop of Makruk Thai can not move as fast as a Bishop of FIDE Chess, the strategy of first occupying (11. ... Bb7) and later opening up the diagonal b7 - h1 (see move no.13) will be the winning plan. White has lost too much time by getting his pieces into position - so Black is the first one to occupy the g-line. Opening up the door: the right black Bishop is looking at square e4. The Bishop is starting the long march on e4. Now the plan is: 16. ... b5 plus 17. ... c4+ (18.Na5 Qb6). There is not much left that White can do against that. The blunder 16.Bb3??? ... would be goofy (16. ... b5 plus 17. ... c4+). That possibility is the final result of the senseless try 4.Nc4!?!?... . Barely avoiding the funny Harakiri of 17.Nd2?? ... : Then the White King would have been trapped right in the middle of the board - so Mr. Mendel would have to sacrifice a horse - 17. ... c4+ 18.Nxc4 ... (there is no other way to prevent check-mate) 18. ... bxc4+ 19.Kd2 ... . The ideal position for that Horse. Now the thrust of the tank force. At this moment the battle has been interrupted on May 8th, 2004; the fighting has been resumed on May 23rd, 2004. Defending square no. a5 against the eventual occupation by the White Rook - thus avoiding the loss of Pawn b5. Hoping for a chance on the a-line. Black has checked out the remaining possibilities of White - and he has found out: the invasion of the White Rook via the square a8 is leading to nowhere-land. Just a demonstration without real value: White should have played Ra8 at once. Winning that important Pawn. That does not necessarily mean the end in Makruk Thai - but in this special case of a total blockade of White, the situation is different. The beginning of the end: the joint force of Black Rook, Black Knight plus the new Queen will start the final assault by moving from the right flank of White that has already been conquered to the center and the left flank of Mr. Mendel - thus squeezing the White army. The White Rook should have rumbled to d8 in order to create at least a little bit of confusion. Now, on the hopeless position h4, even the Rook can not move anymore. Now White is paralyzed completely. And he is helpless against the swing of cavalry 32. ... Ng4 - being the harbinger of total destruction. An incredible stalemate - in a stadium of the match where there are still so many pieces on the board. Makruk is easier than international chess,the tactic are more easy, strategic only if you have a blocked position Â . You have to calculate the endings, many times are DRAWS because the thai makruk rules. A example ofÂ the more played opening defense :Â 1. Bc2 (more flexible),Â Bf7 2 Nd2, Ne7Â 3 e4, c5 4 Qf2, d5 5 Qe3 ,d5. 6 f4 Qc7 7 Nf3,Â Nc6 .8 b4, g5 9 Bb3 , Bg6 10. Bf2, Qd6 11 Kc2,Bc7 .12 a4, b5 =Â Â The queen many time is exhange forÂ one pawnÂ to create two chained pawns. Dear Mr. Ludwig, khup khun krap! Thank you very much for your most valuable informations. Yes, indeed, I am very much interested to get informations about that great player of Mak Rook, the most venerable monk Khun Maha Por. The reason: Actually I am working on the project of a reportage on Thailand and its unique version of chess; that's why I would like to meet Khun Maha Por, if possible. Do you have any more informations about him? Is it possible to meet him? Besides one most interesting question: Khun Maha Por is supposed to be the strongest player of Mak Rook, actually; but if he is not taking part in tournaments - how come that rating? Has he won duels - against various strong challengers - that have taken place at the temple, the Wat Pradu? Has he published basic books or articles on Mak Rook? I am thankful for any informations about that. Dr. René Gralla, Hamburg/Germany, e-mail: <[email protected]> PD. Unfortunately the project of the World Champion of Western Chess playing against the Champion of Mak Rook has had to be postponed for the time being, it ha turned out to be impossible to organize sponsoring for that project.